Choosing a hotel is not an easy thing to do when I travel with my family. There are particular amenities that I look for and I insist on CLEANLINESS in a room. Honestly, I am really particular about the sanitation in a room, and beds are the first thing I look at, if they are gross, I don’t even go to the room, I head right back to the front desk and ASK for a new room, so you can kind of get a feeling for how I travel. 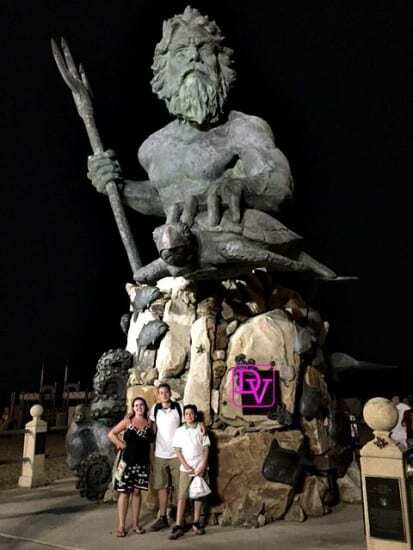 Our latest chapter of family travel had us packing up and heading to Virginia Beach to experience all that we could on the boardwalk and surrounding area. My kids are world-travelers, but we often miss the places closest to our home, and this was so exciting for them. Where do you stay in Virginia Beach that offers a family atmosphere, a pool or two, and the beach right at your fingertips? As an added bonus, if you have a child with food allergies and need a great snack bar for all hours of the day, this is a can’t miss for your family! Our destination in Virginia Beach was right off of Atlantic Avenue, at the Best Western Oceanfront in Virginia Beach. 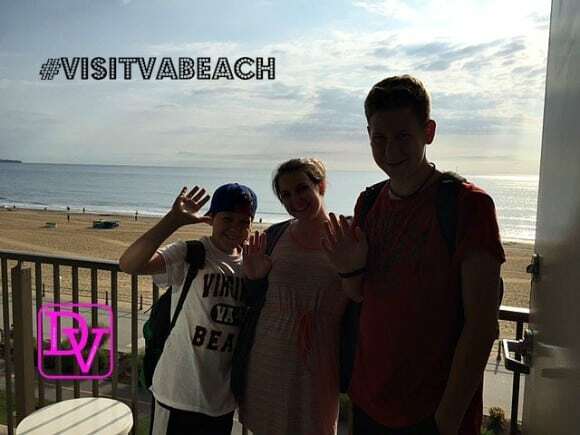 Lavishly live this tale of family travel to a great location out loud as we head to the Best Western Oceanfront in Virginia Beach to explore and experience the area. What Makes the Best Western Oceanfront a Good Choice For Families? Traveling with a family is different, quite obviously than traveling with a partner, spouse, friend, etc. My kids are always in eat mode, so a refrigerator is always a nice amenity and this room had that option in it without an extra charge. I love the fridge factor because when we eat out they bring stuff home and beverages can be kept in the room as well which are perfect for porting to the beach. 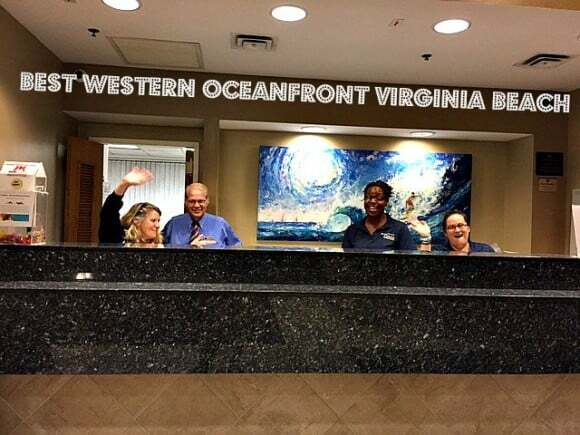 Want to see our room and what the rooms look like in the Best Western Oceanfront Virginia Beach? Take a look at my video, it will show you the whole room! The beds in this room were squeaky clean, and the pillows were fresh as well as the linens, and trust me, not all hotels are clean, we have packed up and left because of some nasty situations, but no there! The carpet beneath our feet was free of stains and the a/c ran and kept us cool, so this was perfect as it was so HOT while we were there. As for the rooms are they clean? Yes they are they offer two double beds, refrigerator, microwave, and a coffee pot. They also provide the coffee for the coffee pot. You have a wonderful view of the ocean all the people that are biking and walking on the boardwalk. On a clear day you can see so far it is just immaculate. This is a view from our balcony! The rooms are best for a family of 3 or 4 depending on your sleeping preferences. Every room on the oceanfront side had a balcony and we could see the boardwalk, and the ocean which was perfect for looking at dolphins in the morning and sometimes later in the day. We could also gauge when best to head to the ocean based on crowds since we could see it all. Right in front of our hotel was a shower, which was perfect after a day at the beach, to rid that sand. I was very happy to find out the breakfast was included in the morning. It is a bit beyond a continental breakfast as it does offer toast, but it also offered cheesy grits, eggs, and additional warm entrees like French toast as well as juices and cereals. One morning we had waffles too, so there is an ever-changing rotation of food and it is clean. The seating can get a bit tight depending on the time of day you head in to eat, so we got there early before it got real busy. The seating is inside and in the enclosed patio as well, or you could just take your food with you to your room, so there are plenty of ways to get the most important meal of the day into your belly. Do make a note that if you are looking for sweet rolls, they are not in the location with all the other food, they are right as you WALK into the restaurant on your left at a little table in the back with some coffee and ummmm are they good. Another little note, my son did dine here, but we could not find anyone to ask about latex, fish and nuts, so we kept it to cereal and milk in a bowl, but he DID eat. 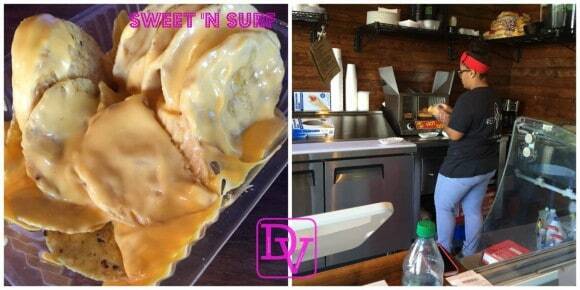 Speaking of food, my kids love their ice cream and nachos and the farthest entrance in the back where you head out to the boardwalk is where you will find a great Sweet Shop. My son with food allergies at there because the girl working there went through all the ingredients and was happy to do so. He ate a hot dog, ice cream, nachos, you know all the fun stuff, because he could as it was free of Nuts, Fish, and latex! Additionally, the price for 2 cones was under $7 compared to a killer price at the DQ the night before of $13 which is pretty insane if you ask me, so this is where to get your ice cream! This was where I had a bit of difficulty, but soon found out that time around the pool was best spent on my phone using the WiFi, lol! There is free Wi-Fi but it is best obtained either around the outdoor pool or in the front main lobby the rooms do not really grab the WiFi however, I do want you to know that when I mentioned this to the front desk, they offered me a different room without hesitation(as they were available), but I just came down to the lobby late at night or worked when I was around the pool, not a big deal. The hotel complex is large, but the outdoor pool has fabulous WiFi capabilities and my kids liked this pool! Now I want to talk about parking. I am going to start out with my personal feelings on parking, and it is no real reflection on this hotel, but it is true for ALL the hotels up and down Atlantic Avenue, just a it was in Myrtle Beach last year. Getting there right at check-in time may not be advisable, as we did and parking was so scarce it was like water in the desert. My level of frustration with this parking issue just continued for the whole trip, until the last late night, when someone pulled out of the hotel front 30 parking spaces and I pulled in. However, there is a very convenient parking lot right across from the Oceanside and it houses many more cars, and you can load and unload at the hotel then drive across. The parking garage keeps the vehicles out of the sun(if you are lucky enough to get underneath) as we did. I have a huge SUV, so I will make this note as well, it was super hard to maneuver through the parking facility, but not impossible and backing in is your best bet. Once we parked the car, we never got it out again until we left because you could walk to everything or take the trolley bus($2) up and down to your destinations. I also found out that most of the other hotels on Atlantic that are Oceanside charge a minimum of $15 a day to park(even across in their garages) and the Best Western Oceanfront does not, so really, when you don’t need your car, and you are going to be in the area, once you are parked just don’t worry about it. I can assure you that most of the people there are doing just that because cars were not moving from their spots! Additionally noteworthy was the outgoing staff, my kids went and asked for an extra pillow, and I needed WiFi help, they were all over it, without hesitation and this was for every guest that asked, because I was in the lobby and watched and listened as I worked! The hotel is centrally located on the boardwalk and you can walk down from 28 or up from 28th to cover it all. I found that most restaurants were on Atlantic, and many little cafe places were on the boardwalk itself. Shopping is abundant on Atlantic and busy all day, everyday, it’s a blast! We shopped and shopped for candy, tees, and anything else, because it was so easy to access. In addition to shopping there are shows on streets(magicians, etc) that just preform for your enjoyment. Here you can see The famed King Neptune Statue down just a few blocks on the boardwalk from our hotel. Atlantic Avenue will serve as your shopping haven and your pizza places as well as your pharmacies. You will find many great stores to find T-shirts and plenty of souvenirs to take home with you as we did. Don’t forget to grab those coupon books because they do work well and offer you some substantial discounts or you might even find a few freebie items to go along with your purchases so grab a coupon book that you see. Coupon books are available in the lobby or from your concierge. The Best Western Oceanfront Virginia Beach boasts both an indoor and outdoor pool. 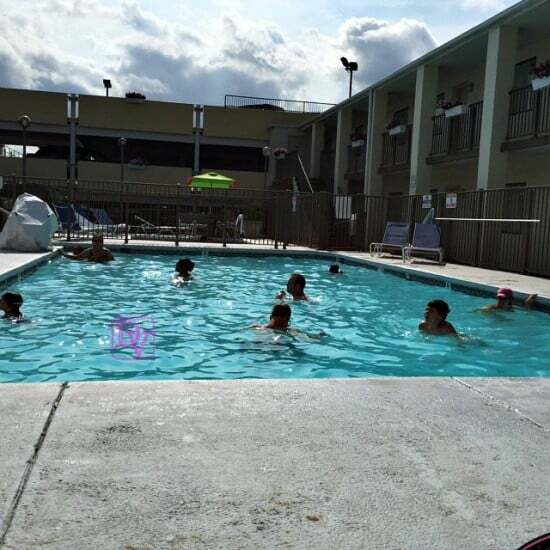 We preferred the outdoor pool so that we could continue having fun in the sun but the indoor pool is right off of the boardwalk whenever you enter into the building. In the same hallway that you find the indoor pool you will also find the Sweet n’ Surf shop as previously mentioned. In addition to the indoor pool area, in the same place you will find both a fitness room as well as an arcade. Did I forget to mention that you can get towels from here? Just make sure to return them but there are towels for all of the patrons of the hotel. 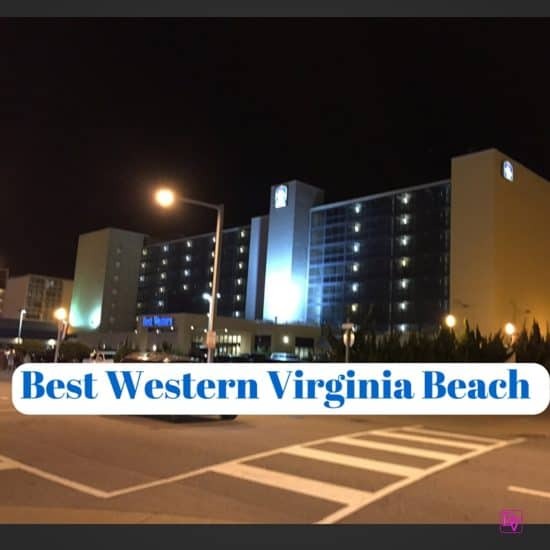 The best Western Oceanfront on Atlantic Avenue in Virginia Beach makes it easy to have a fun family vacation. You can have an adventure by heading out to Adventure Park, or the Virginia Aquarium that are both so close or you can shop till you drop or you can take in some of the history that is along the boardwalk. The nightlife is incredible and family perfect a good mix of fun, shopping and food all in one place. There are great bands that play along the boardwalk, you can just grab an ice cream cone or just kick back on your balcony, no matter your choice, your room is ready and waiting at the comfy Best Western Oceanfront Virginia Beach. Lavishly live life out loud and travel while you stay at the Best Western Oceanfront on Atlantic Boulevard in Virginia Beach. I love staying by the beach when we go to the beach. Sounds like a wonderful trip and your pictures are great. Wow fun, fun in the sun! Seems like you did have a fun vacation. 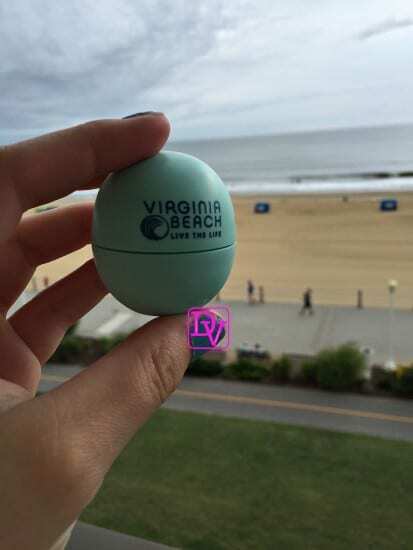 I have never been to Virginia beach, but I would love to. The hotel you stayed in looked really nice, and I love that every where you wish to go in that area is within walking distance. How cool is that! I’ve only stayed in a hotel once and it was a great experience. I love when they offer complimentary breakfast. Clean rooms and bed is so important! I love Virginia Beach and it looks like you picked a great spot to stay at. I love how convenient everything is to where you were staying. Lovely vacation! A trip to Virginia Beach sounds so inviting. Having breakfast included in the price usually sells my husband on the hotel. I love staying near the beach when we travel!! This Best Western looks perfect for staying at with a family! The statues and the pool both look very interesting. Those two would be number one on my list if I was there. This is a lovely place, perfect for a trip with the whole family! I’m glad you enjoyed your visit. The food looks great as well! Sanitation is important to me as well when looking for a place to stay especially if i am with my boys. Next to that is proximity to our itinerary and places to visit. I have never been to Virginia Beach, but it is on my list of places along the East coast to go to. It seems like you had a nice family getaway and the staff was good to you. Parking can be an issue in so many places, I am sorry it was a challenge. Sarah Bailey recently posted..The Ultimate Free Stuff Guide – Five Tricks You Must Try!